AP special campaign "Mana Vooru Mana Badi to complete the Admissions for academic year 2018-19 in all Government/ Mandal Parishad /Zilla Parishad Schools from 23rd April to 30th Apri 2018 Instructions issued as per Rc.No.5178/R3/2018 Dated:19/04/2018/AP Mana Vooru-Mana Badi Campaign Completing the School Admissions from 23-4-2018 to 30-4-2018 Instructions as per Rc.No:5178/AP Mana Vooru-ManaBadi" campaign appropriate committees may be constituted at the District Level, Mandal Level and School Level, the following teams as per Rc.No:5178/AP School Education Mana Vooru-Mana Badi Campaign Completing the School Admissions for the academic year 2018 - 19 from 23-4-2018 to 30-4-2018 - Instructions issued as per Rc.No.5178. AP School Education Mana Vooru-Mana Badi Campaign Completing the School Admissions for the academic year 2018 - 2019 from 23-4-2018 to 30-4-2018 Instructions issued as per Rc.No.5178/ R3/2018 Dated:19/04/2018. RTE Act No. 35 of 2009 Procgs. Rc.No.238 Re. No. 238/A81/ 2018 Dated:13/04/2018 of the Commissioner of School Education, A.P., Amaravathi. 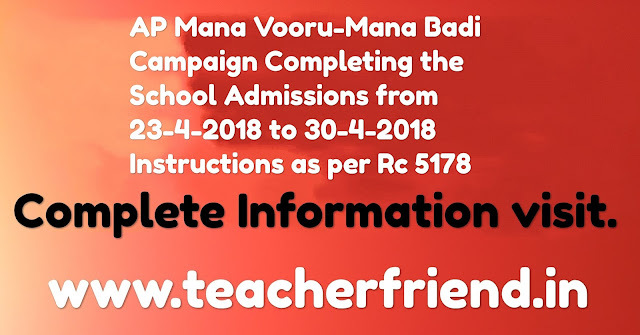 AP Mana Vooru-Mana Badi Campaign Completing the School Admissions for the academic year 2018 - 19 from 23-4-2018 to 30-4-2018 Instructions. All the Deputy Educational Officers, Mandal Educational Offices and Head Masters of the Government/Mandal Parishad /Zilla Parishad Schools in the District are informed that the Commissioner of School Education, A.P., Amaravathi has issued instructions that 'under Right to Education (RTE) Act 2009, the Right to Education is accorded the same legal status as the Right to Life as provided by Article 21 (a) of Indian Constitution. Every child in age group of 6 to 14 years shall be provided up to 8 years of Elementary Education on admission to an age appropriate class in the vicinity of his / her neighbourhood. It is further informed that there is a declining trend in Government schools' enrolment over the years. This is resulting in closing of zero enrolment schools,merging/ consolidation of non-viable schools with neighbouring schools during the rationalization process. Multi-grade teaching becomes inevitable when the enrolment does not justify allocation of full complement of teachers. Further, continuous efforts to identity Out of School Children (OSSC) needs to be made to ensure that all children are enrolled in schools. In the above context, it is proposed to take up a special campaign "Mona Vooru Mana Badi to complete the Admissions for academic year 2018-19 in all Government/ Mandal Parishad /Zilla Parishad Schools from 23rd April to 30th Apri 2018. 1st To take up and complete admissions in schools for the academic year 2018.19 from 23rd April to 30th April 2018. Children completing 5 years of age from AWCs or others to be admitted in Class I. Children of the special focused groups i.e migrated, slum areas, deprived & disadvantaged groups. Out of School Children ( Never enrolled & Drop outs ) Children residing in the vicinity of Model Primary Schools. Ensuring that students, who have completed Class VII/VIII are to be admitted in Class VIII/IX in High Schools from 23rd April to 30th April to reduce secondary level drop out. Ensuring that all the V Class / IX Class students who are targeted for liana Mama Programme to attend in the allotted centres. Creating awareness on Gnana Dhaara Summer Residential programme among all SMCs, students, teachers and parents. Creating awareness on incentives / schemes provided by the Government to the school aged children. To make aware the parents of students who are studying in private schools about the benefits being provided by the Government. Benefits provided in Govt Schools to be highlighted during the campaign. Providing nutritious Mid-Day Meals with 3 eggs per week. Parallel English Mediate Sections in High Schools. Providing quality education through digital class rooms and virtual class rooms. Stress free Education through Continuous and Comprehensive Evaluation. Bicycles to the girls of secondary schools under Badikosta scheme.